Q: I’m once again considering using active electronics on my bass, a pre-amp of some kind. It is still a bit of a debate I notice amongst bass players. Some say it’s “colder,” some say it’s difficult to work with, especially on stage. I even had stories from sound engineers who are not too keen on active basses when having to amplify them. I love my passive bass but have to admit that recently I’m tending more towards active, being able to boost mids, for instance, I find very effective. I’m very curious what your experiences are and if you could shed some light on this matter. A: I have been all over the map throughout the years on this one and have come to the conclusion that it very much depends on the specific instrument. It is indeed nice to be able to tweak your EQ on the fly (especially those mids, as you mentioned) but we also have EQ’s on our amps so I’m not convinced that it’s a crucial need. Personally, I have come to prefer a passive bass with separate volume controls for each pickup and a tone knob. I’ve found that this configuration gives me much more control over my sound, partially because I have a real blend of the pickups and can refine things via the tone knob. But, I have had basses in the past which really only sounded good with an active, onboard pre-amp. I’ve always had an active/passive switch of some kind on my active basses, primarily in case I had a battery go out during a performance and would explore the sound of the instrument both with and without the preamp engaged. I never really got a sound I liked until I had Pete Skjold give me separate volume controls (as opposed to a pickup pan knob). Now, I don’t even bother with preamps. I love not having to worry about keeping my bass plugged in and draining batteries, worrying about battery life on the road and it keeps me from constantly fiddling with my knobs while playing. It also gives me fewer knobs to fiddle with and, I don’t know about you, but it seems like the more knobs I have, the harder it is to dial in a tone I like. The more parameter’s I have, the harder it is for me to find something I like. I’m not sure if it’s because there is more opportunity for settings to interfere with themselves (one knob counteracting another) or what, but I seem to have an easier time of it when I only have to worry about neck vs bridge pickup balance with a touch of tone knob tweaking. I also tend to keep my amp pretty flat but will dial in bass, mids, and treble to eq for the room, if necessary. 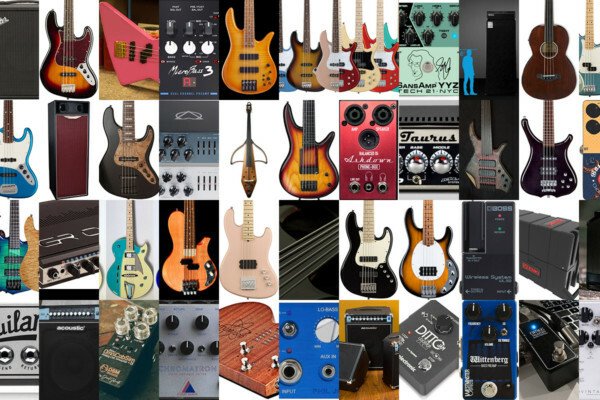 As I mentioned though, I have had some basses in my life that just never seemed to come to life without a preamp, so I would tailor your decision to each instrument individually. If a bass is built with a certain sound in mind, including the use of a certain preamp, it may not come to life when played passively while I’ve also had basses that only seemed to sing when used without the preamp. Late last year, I had the chance to hang with the guy who builds all of my basses, Pete Skjold. It was my first time actually in his shop and I had a blast playing all of his different instruments he had in progress and ready to be shipped out. Pete is someone who excels at building instruments specifically for the player. I was stunned by the difference in different basses meant for different people. My Skjold’s are always perfect for me, so I thought they would all be like that. Wrong. My basses sound amazing to my ears, passively and they all play like butter. I played different basses in there that I couldn’t get to happen passively and it was because those basses were built with a specific sound and a specific preamp in mind. I didn’t realize how greatly different wood combinations could affect things on an electric instrument (we always hear that kind of thing but I was always a bit skeptical, to be honest). The reality was that my basses were built to produce the sound I had in my head when played passively. Thus, your sound may be predicated upon an active instrument. or not. I know some players who would never use an onboard pre and I know other players that would never be without one. They all have a sound and they know how to get it. If your preamp has a gain dial (often inside the control cavity), I would match the output volume to that of the bass running passively, and then flip back and forth to see what it really adds before you start tweaking eq. Often times players think the preamp improves the sound simply because it becomes louder when engaged. This effect is easily negated when you equalize the output volumes. If it’s just a matter of eq, the amp may be able to dial in what you need. Or maybe you just prefer the EQ of your basses pre to that of your amp? I also have some passive basses that have a hotter output than most active basses. Your output level really shouldn’t affect the front of house sound man once he has dialed in his own gain levels to work with yours. Personally, after being a fan of onboard preamps for decades and only recently really starting to prefer passive instruments, I can say that it really depends on the sound you are going for. Active basses introduce more variables into your sound. You now have multiple gain stages and multiple EQ’s to contend with, when working in conjunction with a pre/power amp in your rig. Some people prefer to have as many options as possible but I find that far fewer people really learn how to make good use of those options. I’ve come to find that, for me personally, passive basses have a more open sound and I’ve found it much easier to blend well with the mix of the band because of it. Many active basses have a very overt sound and can be hard to place in the mix because every little thing cuts through the mix, thereby making it more difficult to place the bass well with the kick-drum, for example, while not getting in the way of other frequencies. I would love to hear other reader’s opinions on this one. I’m not, by any stretch, a well-informed gear-head. I’m a bit of a troglodyte when it comes to the technicalities involved with gear, which may be one reason that I’ve come to decide that less is more when it comes to what goes on in my signal chain. Readers, what’s your take? I’d love to hear it. Please share in the comments.